The Exacq headquarters is located in Indianapolis. 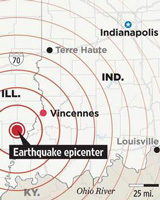 This morning, at 5:37 am EDT, we were awoken by an earthquake whose epicenter was southwest of us, near the town of West Salem, IL. The US Geological Survey reports it as having been a magnitude 5.2 quake. Local news coverage of the earthquake is here and here and here. We reviewed the surveillance footage from our exacqVision surveillance systems at our office for the time of the quake, and saw quite a bit of shaking. Below are two brief video clips taken from the systems. The top clip, from one of our lobbies, is from an Axis 233D network dome IP camera that is mounted on its side. The bottom clip, from a back storage room, is from a JVC analog camera connected to the exacqVision Hybrid unit. And as we were writing this post, an aftershock hit, at 11:15 am EDT.